Lots of so-called "smart thermostats" have been arriving into the UK market recently. BT have been marketing Hive (complete with nonsense advert), Google have put their money into Nest, if you've got the money then evohome will allow you to set a different temperature in every room of the house. For my money I've invested in Tado and their intelligent thermostat. Here's why and what I've found. You can download the Tado app for both Android and iOS based devices. 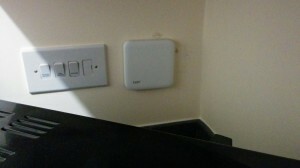 The neat little app allows you to control heating and hot water from your device wherever you're connected to the Internet. You can change the temperature, boost the hot water and all of the things you'd be able to do on your standard boiler control unit. So far, so fun. Not a massive value add though (how often do you change your heating temperature or schedule?) and won't save you much energy, unless you forget to turn the heating down when you go on holiday in the dead of winter. This is what Hive and Nest will do for you. This is where Tado really adds value. If you have a fairly irregular schedule then it's really hard to know when to set your heating to come on and go off. Tado solves this problem by using your smart phone's GPS capacity. The Tado app lets the unit at home know when everyone in the house has gone out and can therefore automatically turn the heating down for you. It uses this geolocation service to estimate how long it'd take for you to get home and therefore lowers the temperature appropriately; when it senses that you're getting closer to home again it'll bring the heating back up for you so it's nice and cosy by the time you open the door. The further everyone is from home the lower it'll allow the temperature to get in order to save more energy. Tado is connected to the internet in your home. That means it can monitor what the weather is like in your area and use that information as a factor in how to heat your home. For example, if it knows that it'll be really sunny outside then it knows that it can leave the sun to heat your home instead of the boiler. Tado also learns how quickly your home heats up and this can help it to be more efficient too. It knows if the residual heat in the radiators will add another 1.5 degrees to the home temperature so can shut off the boiler before it hits the target temperature. The box also includes a wireless thermostat so, if you like, you can ensure that the target temperature applies in whatever room you're in. Some rooms heat up more quickly than others! Apparently, they are shortly to release Tado Care which uses the digital interface of the boiler to identify problems early before the boiler packs up. This is a free addition to the Tado package and will be great it if works! Tado comes in three bits: a router (which plugs into your router and connects the main box to the internet), a wireless thermostat (solar-powered), and the boiler control unit. The unit was a bit fiddly to install and you need to feel comfortable working with mains electricity. The box replaces your existing boiler control unit and Tado provide comprehensive instructions. I'd never done anything like this before but had it working within about an hour. If you don't want to do it then Tado will arrange an engineer to install for you for £50. You can get the unit under two payment models. You can either buy outright for £249 (+p&p), or you can rent for £6.99/month. They reckon it'll save £100/year so you should get your money back. When I last checked the voucher code richard_10 got a 10% discount at the checkout. I got mine during August when they were doing a £3/month summer sale, so look out for bargains! It seems to, although the heating has been off... It successfully detects when both of us are out of the house and adjusts the target temperature accordingly. Had the temperature dropped below 20 in the last month we'd have seen some action! The coffee cup at 7am indicates that the target temp moves from night-time mode to day mode. You notice that the temperature soon takes a quick rise because the day-time target is 20 degrees and overnight the temperature had dropped below this. You can just about see an area of solid blue under the graph at this point - this indicates times at which the boiler is actually heating the house. Shortly after 7am is a symbol indicating that someone has changed the settings. Just so you know. Just after 11am there's a green symbol with a person walking. 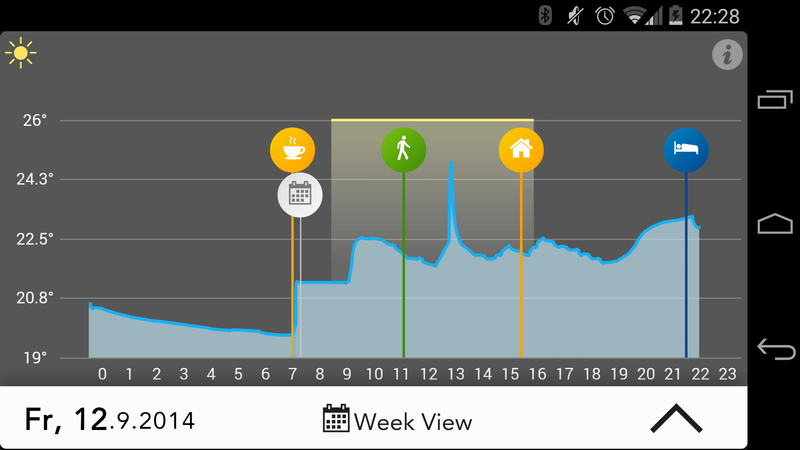 That shows that at this point Tado detected that everyone was out of the house. I'd left at about 8am, but my wife didn't leave until 11am. At that point Tado knows to turn down the target temperature. In this case it knocked the temperature down to 18 degrees because neither of us had gone very far. If we went further it would knock down the temperature further. Tado won't allow it to get so cold that it won't have time to heat up again when you start to come home. At about 3:30pm the "Home" symbol appears to indicate that normal service has resumed because someone has come home. Then, at 9:30pm we move into night mode and Tado will allow the temperature to drop to whatever you set as the night-time minimum temp. You might notice some yellow shading between about 8:30am and 4pm - this is where Tado is detecting that sunlight is keeping the place warm. There's a little blip in the temperature at about 1:30pm - I think that's when the temperature sensor was in direct sunlight for a few minutes.